Nike is not a sponsor of next week’s coveted World Cup, but exclusive data from Globe Runner reveals that the brand is catching up to Adidas’ official stake via social media. Globe Runner’s data is generated by a command center called SociaLitmus, powered by MutualMind. The social hub tracks mentions of World Cup sponsors, partners, teams, athletes and matches for one month leading up to the games. The research pulls in specific keywords for both brands and the World Cup across Facebook, Twitter, Tumblr, YouTube, Reddit, LinkedIn, Instagram, Google Plus and Flickr, as well as news sites and forums. The bulk of discussion is happening on Twitter, per Globe Runner. From May 24 to 30, Adidas racked up 18,000 online mentions while Nike brought in 6,000. However, Adidas only had about 8,000 mentions compared to Nike’s 4,000 the week before—from May 17 to 23—indicating that Nike still may have a chance to dominate the social space leading up to the games. Globe Runner’s data also measures share of voice for both brands and showed Nike’s to have grown from 14 percent during the first week of May to 25 percent by May 30. Sports fans may remember when Nike unleashed its Write the Future campaign for the 2010 World Cup. Findings from Nielsen indicated that Nike was more frequently linked to the World Cup online than any of the tournament’s official partners during the tournament. "What they did in 2010 was remarkable. … Even though they’re not an official partner, they somehow manage to insert themselves into the conversation," said Alicia Kan, social media strategist at Globe Runner. For perspective, Adidas Soccer has 1.2 million followers on Twitter, 17 million Facebook "Likes," more than 470,000 Instagram followers, about 47,000 Google Plus subscribers and roughly 350,000 YouTube followers. Nike Soccer claims about 920,000 Twitter followers, 36 million Facebook "Likes," 1.4 million Instagram followers and 215,000 YouTube subscribers. 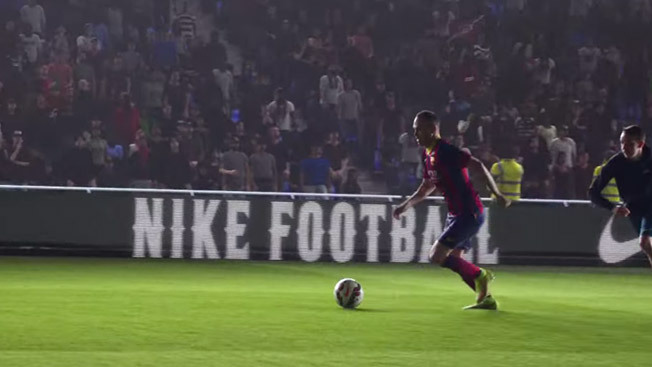 Although not specific to its soccer business, Nike’s Google Plus account has more than 2.2 million followers. "Think about how much Adidas is paying to be a partner for FIFA," Kan said. "Now that we’re closing in on the kickoff, Nike’s going to ramp it up big time."